Based on physical formulas, it gives you the right lighting from the most common environment: the sky. 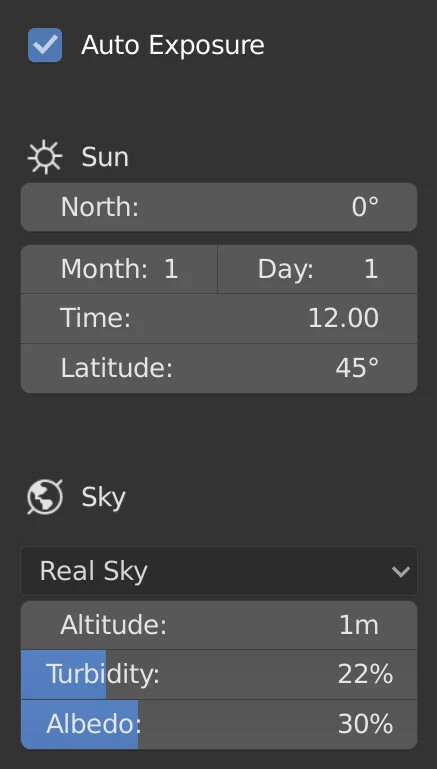 Real Sky accurately simulates the scattering of the sun’s rays through the Earth’s atmosphere at any given time of the year. There are 2 sky method: our sky colors method and the traditional sky texture method. Just by changing the month and day values you will get the accurate position of the sun in the sky, so you can create any kind of condition. Not only the sky itself but also the four procedural clouds are based on real clouds shapes. The clouds themselves have physically accurate materials to suit any kind of climate. 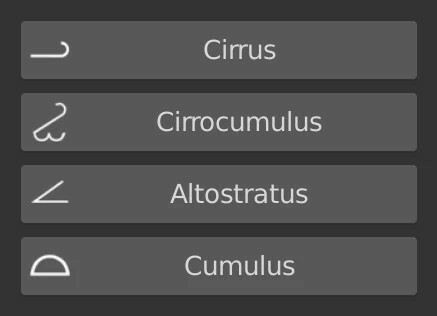 Cirrus, Cirrocumulus, Altostratus and Cumulus. This addon does a fairly good job of automating both background and sun itensities for time of day. However, please add an offset from the origin option, similar to what the Sun Position addon has, as it's currently unusable for Eevee. This is exactly the product I wanted to use for my scenes and it's great. 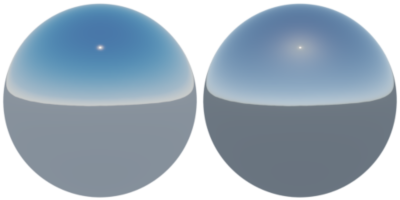 However, when I try to add sky with objects, the lighting does not function properly and leaves a darkened sky. It also messes with the emission strength of other lights in the scene when using this plugin. Hope this issue will be resolved in the next update. This is what the addon does, since the real world values for Sky and Sun are pretty high, the addon automatically lowers the exposure of the scene, and so if you had an emission shader or a lamp, that one will look darker. I fell in love with this add-on from the very first test project! What a great add-on will most likely replace using HDRI's for me as I love the customization and how the skies fit with a scene, highly recommended. Needs some improvements in the amount of detail in the clouds and hopefully a little better performance, looking forward to future updates. The clouds are not realistic. I'm waiting for your upgrades for something better. Maybe I need lessons, it is necessary a tutorial for beginners. This is brilliant, I tested this out with a material addon I created, and omg its safe to say the results I got with this were much better than my HDRi packs I've used. The fact that you can create timelapses, and add realistic volumetric clouds and have the sun be in the correct place at the correct day and location is beyond comprehension. This is an amazing addon. Buy it! I too am a creator on the Blender Market and I can say that this add-on is very useful, thank you for your good work.